In contrast to the negative news surrounding real estate nationwide in the last few years, the Oklahoma City housing market has shown a remarkable stability. While real estate markets in the hardest hit areas peaked as early as late 2005, and with prices still as much as 40 percent below their peak, Oklahoma City real estate prices still hold their peak value which was not reached until late 2011. One key reason for this is a more value-driven market, which did not participate in the irrational price run ups of the boom years, and which makes new homes for sale in Oklahoma City, OK a good value in terms of price. And the ability of homes in this market to hold their value, even during the distressed climate nationwide, makes any new home purchased in the Oklahoma City area a good longer term investment. Among the other reasons for Oklahoma City ‘s outstanding performance is a strong local economy, with good employment prospects fueled in large part by the burgeoning energy industry. In fact, Oklahoma City was rated the most economically secure of the 100 largest metro areas in the United States. Oklahoma City has something to offer across the whole range of factors associated with a modern metropolitan area. For starters, a key factor is cost of living which is consistently below the national average in a number of areas, among the most notable being housing and utilities. Employment opportunities abound, as the community sees growth in bioscience, logistics and aerospace as well as energy. The Bureau of Labor Statistics ranks the area with a low unemployment rate. Three of the 100 Best Companies to Work For, American Fidelity Assurance Co., Chesapeake Energy, and Devon Energy, are headquartered in Oklahoma City with a growing number of other large corporations having a significant presence as well. 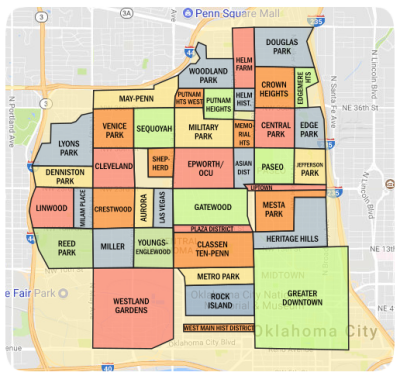 A business friendly environment, low cost living and recent large scale public improvement projects continues to attract employers, fueling an increasingly vibrant economy and increasing the value of new construction homes for sale in Oklahoma City, OK. The metro area offers a range of education choices for those raising a family. The Oklahoma City public school district and a number of surrounding smaller districts offer quality public education and several of these districts include one or more National Blue Ribbon schools. There are as well a wide range of private schools in the metro area that offer a world class education to students. And the fastest growing segment of the educational opportunities within the Oklahoma City metro area may be charter schools, whose curriculum is often tailored to a specific learning style. The weather has seasonal variations with more than 250 days of sunshine. And while the Great Plains are known for tornadoes, your chance of being involved with one is much smaller than you may think. The National Severe Storms Laboratory has calculated the chance of a tornado hitting a given point in Oklahoma as once in 1400 years --- pretty favorable odds for safety. While residents of the metro area have an average commute time of less than 20 minutes, traveling to and from Oklahoma City from anywhere continues to get easier with an increasing number of direct flight connections offered by Will Rogers World Airport. As for things to do, Oklahoma City boasts a surprisingly strong arts community, with three major arts festivals each year. True to its plains heritage, the city hosts more horse shows than anywhere in the world. 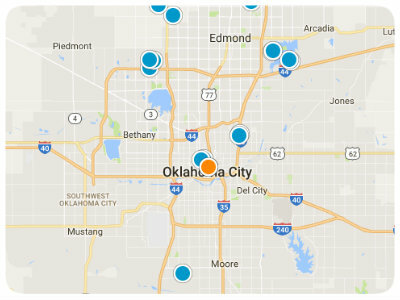 In sports, Oklahoma City is a major league city, being home to the NBA ‘s Thunder and major college football fans have two top tier programs to follow within short driving distance of the metro area. New Home available early Summer 2019. Still time to choose finishes, call today!